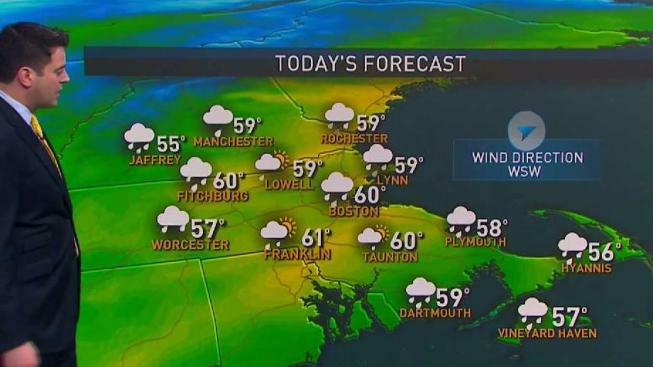 Early fog, a period of rain, then peeks of sun and mild. Highs near 60. Overnight Friday: A few showers southeast, then clearing. Lows in the 30s. Saturday: Sunny and delightful. Highs in the 50s. Easter Sunday: Chance morning sprinkle, North Country snow shower, otherwise windy and fair. Highs in the 50s. A warm front crossed New England last night causing temperatures to rise into the 40s to low 50s this morning. Rain in northern New England, along with melting snow means, some minor river flooding and deep puddles to start the day. Next up is a cold front crossing New England from west to east today with a mixture of sun and clouds bringing temperatures well into the 60s in eastern New England, falling into the 50s west. Early showers give way to a mix of sun and clouds with a possible gusty downpour or brief thunderstorm early afternoon. Wind from the southwest gusting 20-30 mph will become lighter from the northwest later. Clear and dry weather returns with a bright night, as the moon goes nearly full. Temperatures will be in the 20s north and 30s south. Tomorrow looks like a beauty with wind from the southwest pushing temperatures back up to the 50s south, 40s north, and if you're going skiing, 30s in the mountains. A vigorous front goes by tomorrow night with gusty wind, and a possible shower, or a snow squall in the mountains. Low temperatures will be in the 20s north and 30s south. Easter sunrise service looks bright and brisk, mostly dry, with temperatures in the 20s north and 30s south. Easter Sunday turns into a nice bright April Fools Day, highs in the 40s and lower 50s, 20s if you're going skiing. Monday starts sunny and cold, with clouds increasing late with high temperatures in the 40s. Tuesday features a low-pressure system racing at us with a mixture of rain and snow, changing to rain at the coast, but could be snowing in the mountains Tuesday into early Wednesday. Wednesday looks wet and warmer. The Red Sox home opener on Thursday looks bright and brisk with temperatures in the 40s.